Spring is here in Texas. We have done quite a few improvements in the front yard, since we started trying to fix the problem with our grass. Our house is 20 years old and mature trees and shrubs abound. I had a row of boring, huge, overgrown Boxwoods in front of my house. Boxwood shrubs should not top out half way up the window. We tried trimming them to no avail. Nothing would grow in front of them. The flowers you see in the picture below are hanging basket sized plants just stuck in holes. They never grew any bigger than they were when I bought them. Every year I had to dig up hundreds of tiny little roots that were grown all over right under the top of the soil. Mr. Bill decided the shrubs had to go. Usually I am the one who wants to make changes, but this time he set the ball in motion and I resisted. I didn't want to proceed until we had a plan in place. I have heard about people getting a landscape company to draw up plans for them. I really didn't want to do that. We have a fabulous nursery with native Texas plants and thought that we could at least draw a plan ourselves. We drove around looking at homes that had new landscapes. New landscaping doesn't have a row of all the same shrub. There is a layering and a mix of sizes, shapes and colors. We wanted a mix of flowering and non-flowering hardy, xeriscape shrubs. We would add in color with annuals and perennials. We were in the midst of a horrible drought and we didn't want to be irresponsible during the drought and after. Our desire is to be as free from watering as possible. 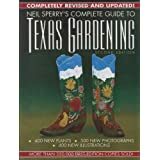 I sat down and pulled out my native Texas gardening books and listed shrubs that would be good for our zone. We are right on the line between 7a and 8b. A local nursery will know your zone or you can google it. I listed plants that I liked and read about sizes. One of the big mistakes in my neighborhood has been the size of the shrubbery. Our builder planted too many shrubs that grew too big. I checked the maximum height of my plantings to ensure I won't have stuff topping out over my window sills again. I wanted to keep my Hydrangea, Crepe Myrtle and Asian Star Jasmine. We planned a taller plant for the corner opposite the Crepe Myrtle, and several dwarf varieties in the middle under the windows. I drew my plan and we headed to the nursery. We chose a local garden shop that uses all organic fertilizers and pesticides.They were a great help and let us "try" out our landscape there under the trees.It looked great but small compared to our giant boxwoods. We got a Cherry Laurel for the corner. I filled in the rest with Liriope, Daylilies, and Begonias. The Begonias can finally be planted in the ground. I pulled this child sized park bench out of someone's trash on my way to work. 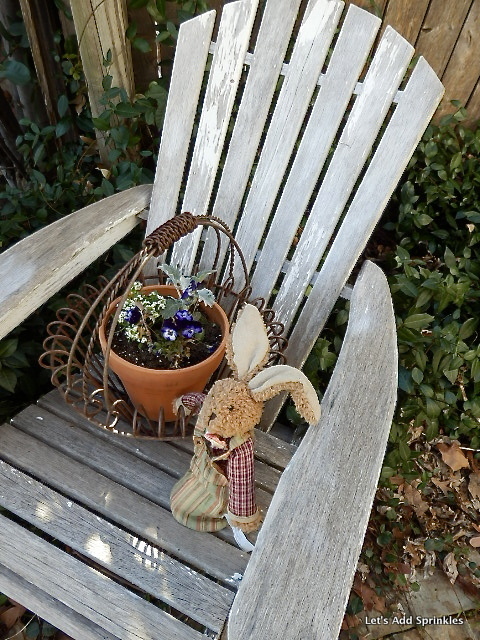 I also pulled this darling adirondack chair out of the neighbors trash. I knew it would be cute holding a plant. We are finishing up the last few feet of a rock walkway. I'll show you it when it's all finished. Oh! Apparently Rebekah wasn't finished either if the updated plans are any indication. I am just not sure where we are going to get a the stuff to make the unicorn topiary and the koi pond. I found the updated plans much, much later. I never noticed that she had added to the plan. I hope you are blessed to have children with a sense of humor. These plans are a keeper. How did you get those boxwoods out of the ground? I clipped them way back and then my husband just started digging around them. The roots were not that deep, so they came out pretty easily. I pulled up Burford Holly once and they were much more difficult to get out. Hope that helps. Thanks for stopping by. I am so glad you enjoyed the humor. It is wonderful to have people in our lives that can make us laugh. i love the different mix of flowers you used. i know nothing about planting, so my garden is pretty unruly and willy nilly. last year we relocated some things, and they did fine, and we also added a rhododendran, and i can't wait to see that bloom this spring. sigh. gardens are pretty but too much work for me! Oh they are work. I love Rhododendrons but they don't grow here. They were a favorite of my moms. Did your Boxwoods smell? Our smelled funny at certain times of the year. I am glad they are gone except at Christmas. I loved having clippings to decorate. Great website.i loved the item completely.